Swimming pools are notoriously expensive to operate. For a successful business plan, aquatic facilities need to offer a swim program to suit all community needs, optimizing the revenue opportunities. Moveable floor and boom systems help to achieve this; by altering the geometry of the pool, multiple swimming activities can take place at the same time. Varying the depth of the pool then broadens the scope of activities from international competitions to mother-and-baby classes. With early design input, we can select the best configuration for your pool to maximize functionality. 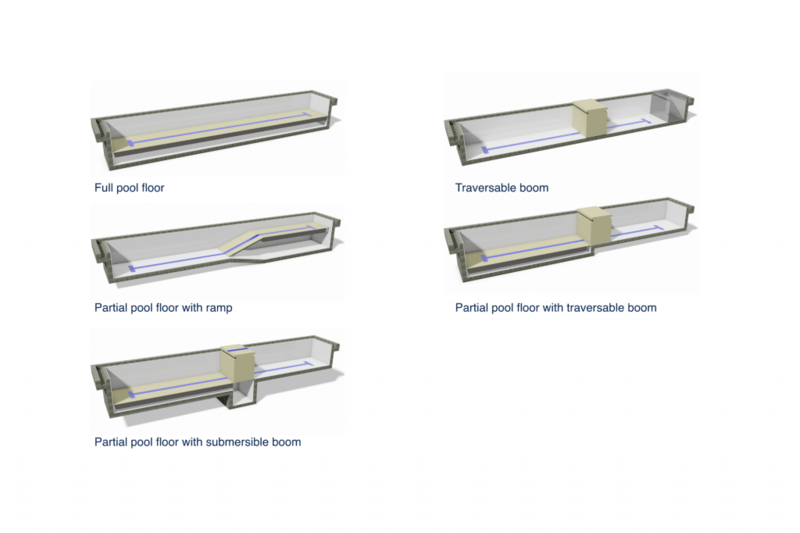 Our moveable floor and boom systems are designed to be reliable, robust and safe. Here's a snapshot of our moveable floor and boom technology. Get in touch if you need our full technical specification. Our moveable floor systems are the floatation type, with direct drive or indirect drive hydraulic operating systems. The Grade 316L stainless steel support structure is designed to deflection criteria and to ensure that there cannot be any deformation, under any circumstances. The surface panels are high grade polypropylene, with non-slip finish to European design standards and integrated racing lane and depth markings. High quality tie-rod Parker cylinders, positioned either at basement level (direct drive) or above pool static water level (indirect drive). The floor is restrained using Grade 316L stainless steel (British Steel) 7×19 construction cables, routed over vertical and horizontal nylon pulley mechanisms. An easy use digital remote operator panel can position the floor at any pre-set depth. Bright and carefully positioned LED displays indicate pool depth and safety information.